Know that you can be in the throes of a compulsive eating mind-state, without having to eat everything in sight. Although sometimes it is hard to remember, you can still make choices! You may already be in a painful mind-state, to be eating this way, but you don't have to assume that you are completely out of control. Know that it is OK to say "no" to foods even when you are in a state that you have labeled "out of control". Feel free to stop any time. I get the feeling we are punishing ourselves for overeating by overeating some more. This is really unnecessary. Quotes: Life is now, now, now and now. Meal 1: A beetroot (beet), carrot, celery, ginger and garlic juice. Meal 2: A raw breakfast bar created with oats, chia seeds, almonds, walnuts, vanilla bean, dates and a dash of agave! 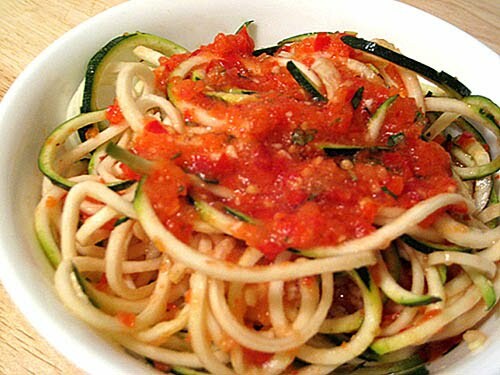 Meal 4: Raw Zucchini Spaghetti. Created with zucchinni, tomatoes, sun dried tomatoes, macadamia nuts, nutritional yeast (cheese), oregano, cilantro and basil! Exercise: Stretching :) and walking.